Quito is a fantastic place to visit and the best place to start your Latin American journey. Quito is also the entertainment center in Ecuador with new bars and discos opening every week and also the best place to shop, either at the small souvenir shops or at big malls. Quito has many interesting cultural sites, historical sites, museums, private galleries, churches, exhibition centers, and theaters. Today Baltra is the most important airport of Galápagos and a small navy base for Ecuador. Baltra has suffered most from human settling and does not have any visitor sites. Many cruises start from the its harbour and already there pelicans and noddies will welcome you. To the north lies Mosquera, a small sandy bank with a large colony of sea lions. Go swimming and snorkeling on the beach. Only accessible by a dinghy, the beautiful and tranquil bay of Black Turtle Cove is a protected national park. Black-tip and white-tip reef sharks, sea turtles, and even sting rays raise their young around the mangroves. Travelers can take a day trip to discover this untouched Galapagos Island. Known for its striking dark-red color, this island is home to a picturesque saltwater lagoon where white-tailed pintail ducks and flamingos congregate. Santiago's Puerto Egas is the perfect place to explore dark, sandy beaches and spot birds and marine iguanas. On the island of Isabela is Caleta Tagus, a trail that surrounds a salt-lake crater. This beautiful region is also known as the "land of marine iguanas." Punta Espinoza is the visitor site on Isla Ferdinandina and is situated at the northeast coast of the island. The biggest colony of marine iguanas is situated here. Hundreds of them sunbathe on the rocks. Besides the iguanas, the island is home to flightless cormorants, Galápagos penguins and sea lions. Mangroves and cacti dominate the vegetation. There are also extraordinary lava formations. Urvina Bay on Isla Isabela is significant due to a recent geological event. In 1954 its coral reef was raised out of the ocean by 13 feet and can now be seen above the water. Iguanas, pelicans, flightless cormorants, rays and Galapagos Tortoises can be seen here. Isabela itself has an abundance of tortoises, animal, bird and marine life. This small, barren island offers guests the opportunity to observe firsthand its volcanic formations and moon-like landscape. Santa Cruz is the center of tourism in the Galapagos. The white-sand beach of Las Bachas on Isla Santa Cruz is a major egg-laying site for Pacific green turtles, but pelicans and flamingos feel at home here, too. 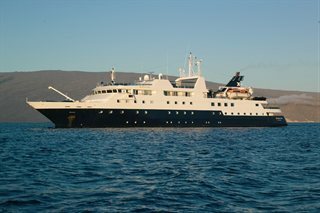 Puerto Ayora, the largest settlement in the Galapagos, is homeport to many yachts, as well as home to Galapagos National Park Service and Charles Darwin Research Station. A large island with a variety of geology, wildlife and vegetation, all the Galapagos life zones are present on Santa Cruz. El Barranco (Prince Phillip's Steps) is a port located on Genovesa Island in the Galapagos Islands. After hiking along a steep and rocky path, spectacular views can be enjoyed from a high cliff. El Barranco is home to Galapagos doves, red-footed boobies, Galapagos swallows and short-eared lava owls. Darwin Bay is located in the Galapagos Islands where one side of the caldera on the horse-shoe shaped Genovesa Island collapsed. The submerged crater that resulted formed Darwin Bay. The steep cliffs that surround the bay provide homes for many seabirds, and there is a white sand coral beach that heads a half mile trail from the bay. Genovesa has developed a reputation as “The Bird Island” due to the numerous bird species that nest there which include swallow-tail gulls, storm petrels, Darwin’s finches, nazca boobies and red-footed boobies. Visitors to Darwin Bay can enjoy hiking, snorkeling, diving, kayaking and dinghy rides. In addition to seabirds, additional wildlife found near Darwin Bay includes rays, colorful reef fish, marine iguana and sharks. Rates are cruise only, per person, based on double occupancy. Taxes, Fees and Port Expenses of $120 additional for all guests. Rates are subject to availability and may change without notice. Restrictions may apply.